Juli Carrillo partnered with Vancouver company Terramera and SFU’s Zamir Punja in the research and development of a new generation of natural pest management products. The research consortium was recognized by Innovate BC with an Ignite award and $241,500 in funding. Innovate BC, a Crown agency, supports researchers and industry in accelerating the commercialization of promising products through its Ignite program. It supports emerging technologies that can solve industry problems in the natural resources and applied sciences. The new pesticide products could lead to a safer generation of plant-based pesticides derived from Neem and Karanja oils using a technology pioneered by Terramera, known as Molecular Delivery System (MDS). MDS allows greater permeability of natural products to insect pests. Terramera develops natural alternatives to synthetic chemical pesticides and fertilizers and led the product development. Carrillo, an Assistant Professor in the Faculty of Land and Food Systems, has worked with Terramera since January 2017 to find out how the MDS products perform in pest suppression, and also to examine the persistence of these products from pests to the predaceous insects that feed on these pests. Zamir Punja is an SFU Professor in the Department of Biological Sciences. Carrillo runs the Plant-Insect Ecology and Evolution Lab at UBC where she investigates ecological pest management, crop domestication, and fundamental ecology and evolutionary biology. “The BC Ignite award will support the development of new organic products to promote plant health in Canadian and global markets. Research into organic, and natural botanical pesticides is needed to provide additional options for growers. 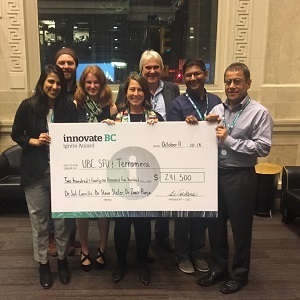 Innovate BC recognized three other projects with Ignite awards, including a new composite thermoplastics product derived from wood pulp developed by a team that includes UBC Forestry Professor Jack Saddler.